The smaller Garudas placed on the top made the whole structure look rather appealing in my opinion. I waited for some pigeons to land there or fly past them, possibly would have made a good attempt at a “decisive moment” frame. No such luck on the day! Well maybe another time. Located near Mangalhat, Sitaram Bagh is a vast complex of temples, samadhis, residential quarters and open areas. The main temple complex consists of a series of quadrangles. Each time one enters a courtyard there is a sense of being overwhelmed by the style, scale and grace of the various structures and architectural elements. Every new courtyard is sure to present a new facet, and thus the complex provides endless surprises. 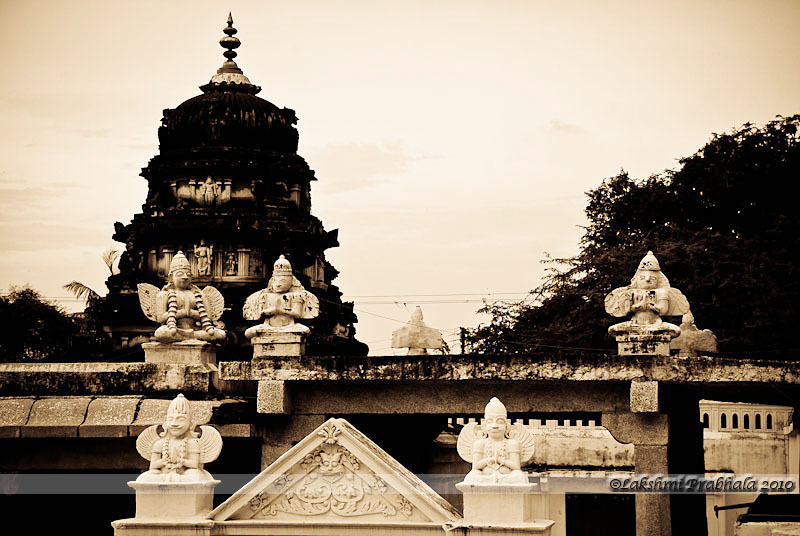 The main temple has not been interfered with, and retains its original settings and grandeur. The most notable aspect of the Sitaram Bagh temple complex provides endless surprises. Sitaram Bagh temple complex is a rare blending of the Moghul-Rajput styles with Qutub Shahi architecture. Some of the structures in the complex are said to be about 200 years old. All the images on this blog are protected by copyright. Please do not copy, blog or repost in ANY way. If you wish to use them please get in touch with me through email.